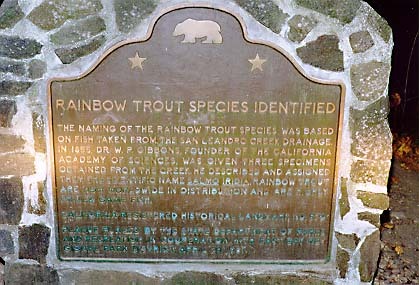 The naming of the rainbow trout species was based on fish taken from the San Leandro Creek drainage. In 1855, Dr. W.P. Gibbons, founder of the California Academy of Sciences, was given three specimens obtained from the creek. He described and assigned them the scientific name Salmo Iridia. Rainbow trout are now worldwide in distribution and are highly valued game fish. 50 yds past Redwood Gate entrance kiosk, Redwood Regional Park, Oakland.